There’s nothing better than relaxing with a good book on a lazy summer afternoon. As an avid reader, I look forward to the summer every year because I know I’ll finally have time for the books I’ve missed out on during the busy winter season. I have met many musicians who enjoy reading as much as I do, but surprisingly few who go out of their way to read books about music. The great conductor James DePriest summed up the attitude of many performing musicians towards the field of musicology when he said, “Writing about music is a little like dancing about architecture.” In other words, it doesn’t really make that much sense. For performance majors at colleges and conservatories, having enough time to practice is so important that reading assignments from music theory and history classes often seem to be not only irrelevant, but an actual hindrance. Like many of my classmates, I struggled to understand the importance of the courses I had to take as an undergrad for my own goals as an aspiring orchestral musician. I wanted to find a job, and in reality, you don’t need to know very much about music history or theory in order to win an audition. “You’ve played an impressive final round and we’d love to offer you a position with the orchestra, but first, could you please discuss the liturgical reforms made at the Council of Trent in 1545?” There aren’t many certainties in life, but I can guarantee that you will never hear these words at a professional audition. So why am I telling you to spend the summer reading a bunch of books when you could be spending those valuable hours practicing instead? There is no question that practicing is the single biggest factor in determining your success as a musician. However, one of the most important lessons I’ve learned since graduating from music school is that artistic success and professional success are not the same things. In the long run, striving for artistic growth will take you much further than pursuing professional achievement. Why? Because becoming an artist is a project for your entire life, and it demands far more than the task of finding employment. One of the most critical ingredients for artistic growth is the ability to question the assumptions that we make every day as performers – assumptions about how to practice, how to use the advice of our teachers, and why we even play music in the first place. Practicing can be quite useless if it’s done without thought. To achieve artistic growth, it’s crucial for our minds to be engaged when we’re in the practice room. Thoughtful practice requires a nuanced understanding of the composer’s intentions, a clear vision of our own artistic goals, and a detailed plan to solve the technical challenges of the work at hand. This is no small task. Bringing a musical composition to life requires a great deal of knowledge, exploration, and creativity, and that is why reading about music is uniquely important: it will help you to broaden your perspective as an interpreter and to discover musical possibilities you could never have imagined on your own. To that end, I have compiled a summer reading list with the flutist in mind. This list is admittedly eclectic, but that is exactly the point. The goal is to encourage flutists to improve their musicianship by learning from great artists of the past, from musicians who play other instruments, from literature and history more broadly—and to find ways of relating the challenges we face in the practice room to larger artistic issues. Each of these works has been important for my own development as a musician, and my hope is that these volumes will help readers to find new inspirations and solutions, both this summer and beyond. William Kincaid was the Philadelphia Orchestra’s brilliant principal flutist for forty years. A founding faculty member at the Curtis Institute of Music, almost every American flutist can trace his or her lineage back to Kincaid. His students include luminaries like Julius Baker, Doriot Anthony Dwyer, Joseph Mariano, and former Detroit Symphony Orchestra flutists Albert Tipton, Clement Barone, and Robert Patrick. John Krell used his notes from lessons with Kincaid as the basis for this comprehensive treatise about the essentials of good flute playing. Many people are surprised to learn that I have a secret past as a cellist. I don’t play the cello anymore, but I learned a great deal from the recordings and repertoire I discovered during ten years of cello lessons. One thing I will never forget is hearing Pablo Casals play Bach for the first time. Grainy though the recording quality may be, his 1936-39 performances of Bach’s six Cello Suites capture something essential about music’s ability to communicate emotion. David Blum’s thoughtful summary of the great cellist’s approach to musicianship and phrasing is indispensible. Rachel Brown is one of the world’s foremost Baroque flute experts. The Early Flute is an ideal companion for modern flutists interested in developing historically informed interpretations of Baroque and Classical repertoire. Brown draws on a wide range of treatises by Quantz, Hotteterre, Devienne, and many others in this accessible and essential work. David McGill has had the rare distinction of holding principal bassoon positions with both the Chicago Symphony Orchestra and the Cleveland Orchestra. McGill was strongly influenced by the pedagogy of Marcel Tabuteau, often regarded as the father of American oboe playing. In Sound in Motion, he delves into Tabuteau’s philosophy of music and his often misunderstood “number” system. A wonderful introduction to the art of phrasing, McGill’s erudition is evident on every page. 5) On Playing the Flute by Johann Joachim Quantz. Perhaps the greatest flutist of the 18th century, Quantz worked alongside C.P.E. Bach for twenty-six years at the court of Frederick the Great. A critical resource for musicologists, there is no better primary source for flutists hoping to gain insight into the musical language of the Baroque. I first studied the Scherzo from Mendelssohn’s Incidental Music to A Midsummer Night’s Dream in high school with my wonderful teacher, David Cramer. After I was finally able to negotiate the technical difficulties of the solo, David asked me to imagine being in a forest, with twigs and leaves underfoot, and to find a tone color and crispness of articulation that would give listeners the sense of being lost in the woods in the middle of Shakespeare’s play. There is no question that reading Shakespeare’s masterpiece will enhance your appreciation of Mendelssohn’s music—and vice versa! There are so many terrific biographies of composers that the genre really deserves a reading list of its own, but I couldn’t resist including Maynard Solomon’s masterful biography of Mozart on my list. This deeply honest portrait explores the composer’s complex relationship with his father and the challenges he faced as he struggled to make his way in the world. The Inextinguishable Symphony is the true story of two young musicians who grew up in Germany during the dark years before the outbreak of WWII. Gunther, a flutist, and Rosalie, a violist, were both members of the so-called Jüdischer Kulturbund, an orchestra of Jewish musicians that performed at the whim of Nazi propaganda minister Joseph Goebbels during the 1930s. After unspeakable hardships, the two ultimately make their way to safety in the United States. A tragic yet inspiring testament to the power of music and love. 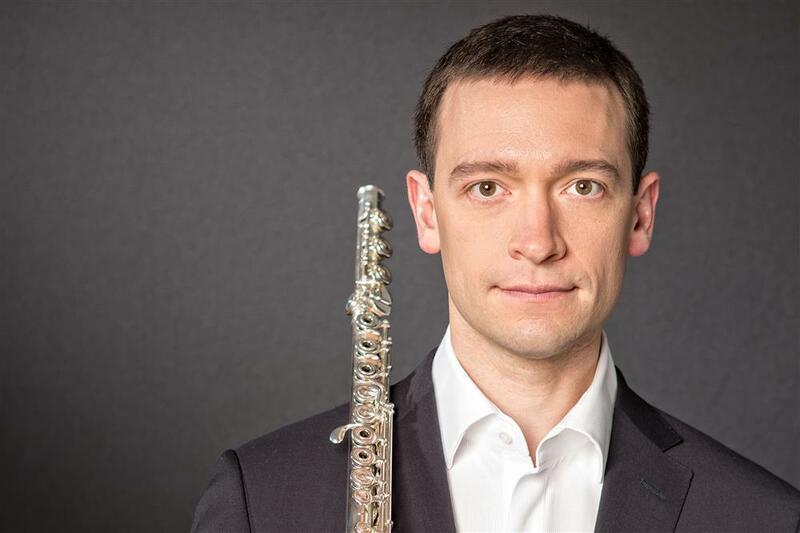 Praised by The Oregonian for his “supple tone, rhythmic dynamism and technical agility,” David Buck joined the Detroit Symphony Orchestra as Principal Flute in 2012. He previously held positions with the Los Angeles Philharmonic and the Oregon Symphony, and has made guest principal appearances with the Chicago Symphony Orchestra, the Pittsburgh Symphony Orchestra and the Baltimore Symphony. As a soloist, Mr. Buck has performed with the Detroit Symphony Orchestra, Detroit Chamber Winds & Strings and the Oregon Symphony, collaborating with conductors including Leonard Slatkin, John Storgårds, Paul Watkins and H. Robert Reynolds. In 2014, he recorded John Williams’ rarely heard Concerto for Flute and Orchestra with Maestro Slatkin and the Detroit Symphony for Naxos Records. During the summer months, Mr. Buck has appeared at the Great Lakes Chamber Music Festival, Oregon Bach Festival, Colorado Music Festival, Tanglewood, Kent/Blossom, Spoleto Festival del Due Monde in Spoleto, Italy and the Pacific Music Festival in Sapporo, Japan. He is a member of the Detroit Chamber Winds & Strings and a former member of the LA Phil New Music Group. David Buck is a graduate of The Juilliard School, where he earned his Bachelor of Music degree and Graduate Diploma. His primary teachers have been Robert Langevin, Jeffrey Khaner, Jeanne Baxtresser and David Cramer. A native of Philadelphia, Mr. Buck lives in Royal Oak, Michigan with his wife, flutist Jung-Wan Kang.